Nuala Woulfe Beauty: A lesson on Hyaluronic Acid. A lesson on Hyaluronic Acid. Hyaluronic acid, along with collagen, is the structure in which our skin cells live. Hyaluronic acid is a natural constituent of the dermis, the second layer of skin that gives structure, firmness, and volume to the skin. Hyaluronic is a polysaccharide. ( polysaccharide whose molecules consist of a number of sugar molecules bonded together). Although abundant in youth, with age and exposure to environmental factors such as UV light, the presence of hyaluronic acid in the skin decreases. Hyaluronic acid attracts water, thereby plumping the treated areas and decreasing the presence of facial lines and wrinkles. Hyaluronic acid is great for anyone looking for a serious boost of skin moisture, no matter what your skin type is. It is non oily with an ability to hold up to 1,000 times its weight in moisture. As it is something that your body makes naturally, so its chemical composition absorbs easily into your skin. Hyaluronic acid is present in all connective tissue and found in high concentrations in the viscous fluid that surrounds your eyes and that which cushions your joints. It’s also keeps skin supple and hydrated: As production decreases as you age, so, too, does the firmness and radiance of your complexion. While topical treatments do not reach the deepest layers of the skin, serums and creams containing hyaluronic acid can smooth the appearance of fine lines and wrinkles through its ability to draw water to the surface of the skin. You can maximise the effects of hyaluronic acid by applying the product twice a day or as required. 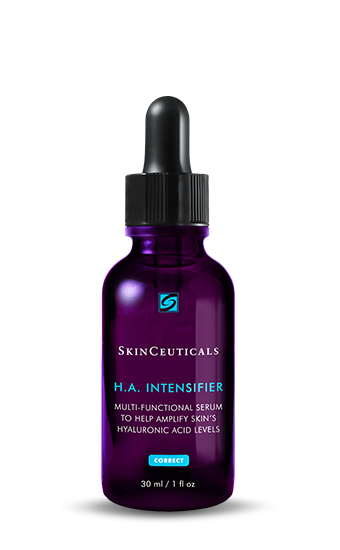 Skinceuticals - The brand’s latest addition: the HA Intensifier. This serum contains 1.3 percent H.A. in various formats (fragmented, encapsulated, and at full molecular weight) to soften and hydrate your skin, it also has purple rice extract (gives serum a purple hue) and Pro-Xylane, to stimulate your skin’s fibrolasts (the cells that make collagen), H.A. levels, and prevent its natural breakdown. Most H.A. products work to hydrate the epidermis (the surface of your skin)—this serum also helps build up the reservoir of H.A. in your dermis, and prevents the natural degradation of your own hyaluronic acid. Purple rice is the seed of Oryza sativa Linne (Gramineae), and is a type of ancient rice originated in Hanzhong, Shanxi in China and is also called purple-black rice or black rice. ( looks black when raw - purple when cooked) Unpolished purple rice has a hard surface and a white inner area, and contains purple black pigments(anthocyanine) in the unpolished seed coat.In ancient times, purple rice was considered to be effective for perennial youth and long life, and have nourishing/tonic effects, and effects on anemia. In those days, purple rice was precious and eaten only by the emperor. H.A. 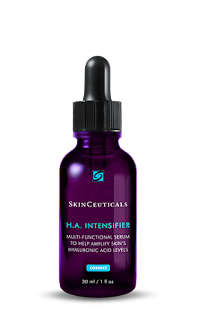 Intensifier is a corrective serum that claims to boost skin’s hyaluronic acid levels by 30%. It uses “multi-modal technology” to enhance natural hyaluronic acid synthesis and prevent against premature degradation, fortifying firmness and plumpness while delivering surface hydration. The serum also contains 10% proxylane to help maintain the structure and function of vital skin components, and 2% liquorice and 0.2% purple rice extracts to provide natural hyaluronidase inhibition. Its potent blend of pure hyaluronic acid, proxylane, liquorice root and purple rice work to boost skin's hyaluronic acid levels, improving skin texture and restoring elasticity. A 12-week, single-centre, clinical study was conducted on 59 females, ages 42-60, with mild to moderate facial sagging and loss of firmness, rough skin texture, nasolabial fold wrinkles, marionette wrinkles, and presence of fine lines/wrinkles in the crows feet area. Hyaluronic Acid Intensifier was used twice daily in conjunction with Gentle Cleanser and a sunscreen. Efficacy and tolerability evaluations were conducted at baseline and at weeks 4, 8, and 12.